I know that You can cure me but I don’t know if you will, and that scares me to death. Lord, help me. I’ve suffered the last three months with what every doctor and radiologist thought was pneumonia. I thought the constant pain in my back and hips were from coughing so much. I thought my difficulty breathing, talking, and singing were from the pneumonia. Sadly, we have learned that is not the case. I have lung cancer. I won’t lie. It’s hard be positive, to be faithful when your mom died of the same disease just three and a half years ago. Just as in her case, mine has metastized to other areas so that makes it stage 4. I used to work with cancer patients at The American Cancer Society. I know the statistics. I also know we have a God that plays by His own rules. I have people around the world praying for a complete healing. For me, that is a hard prayer. Not because I don’t believe it can be done but because so often I have seen Him decide on a different plan. I hope He wants to keep me here so I can be a light onto His people. Only He can make that decision but I have loudly made it known to Him that I want to be healed. My life changed instantly the moment I found out, and so did the lives of my family. I’ll likely be discharged from the hospital tomorrow with oxygen and a walker to embark on an unknown and scary path. I will no longer be able to work, and will be filing for disability. I know that God is with me, and I know that He won’t leave me alone to deal as my family and I sort out what this means for our lives now. It’s just going to take some time. Your prayers give me strength and hope after I get up from my meltdowns. I need my Christian brothers and sisters to keep lifting us up. Please understand that I’m not able to respond to everyone’s messages but I will read them when I can, when I have the strength, and when I need it the most. I love the ministry we have created. I don’t know the end game, what God’s plan is but I will continue to share how God is working in my life, the lessons He is teaching me, and so forth as I am able to. I appreciate every one of you for joining me on this path. I may or may not ever sing again, but remember that salvation is not found in a song. It’s found in Jesus. Don’t waste time on the world when you can run to Him and bow at His feet, relinquishing everything you’ve got. That’s what I’m doing. Crying at His feet. As I sit here, I lay in a hospital bed. Alone. It’s 9pm on a Tuesday night, and my husband has to wake up early to get the kids to school. There are a myriad of emotions I’m experiencing right now. Lonely. Helpless. Emotionally drained and overwhelmed at the same time. I’m still in shock about how I have gotten to this point. If you read my last post, you will remember I was fearless then. That was before I met with the pulmonologist. I haven’t gotten any better. This is the stress I have been dealing with, the pain that has caused me to cry so much in the last week. But in the end, the consistent inability to breathe is what landed me in the emergency room. For months I’ve been wondering at what point someone would hospitalize me. After not being able to catch my breath for an hour and a half on Sunday, I made the decision myself. I asked my mother in law to drop me off at the hospital instead of church. I was admitted almost immediately. They have done extensive blood work and a bronchoscopy. I’m hoping to have the results tomorrow but so far I know there are no tumors and no blockages. That’s a good sign. I’ve been on fluids and two IV antibiotics since I got here, and everyone is taking my case very seriously. There is comfort in that. I’m a little less fearful and a lot more hopeful now thankfully. My husband came back from Miami yesterday where he had been helping with the hurricane relief. He surprised me outside my room when I got out of recovery from the bronchoscopy. I was so happy to see him, I cried out. Well, my hip was still hurting because the morphine hadn’t kicked in yet so that could have been part of it. So where does this leave me now? Back to where I was when all of this started. When I first got sick, during every coughing spell, at each moment I threw up, at every moment I cried out in pain… there was only one left standing. Jesus. This is not to say that He is my last resort. When my family is here, of course I will make time to spend with my family. But I need my time with Him too. I was reading the Bible earlier and a food attendant came in whose name actually comes from the Bible. Elon. It means strong, like an oak tree. I had a great conversation with the the attendant, and I have a gift for her when I see her again tomorrow. I’m having encounters here at the hospital I would otherwise never have. Maybe this is about more than just me being sick. I believe God can use me anywhere, and I believe that He will. But right now… I’m going to turn my attention back to Him. I’m going to thank Him for the umpteenth time since I’ve been here, and delight in the grace He has bestowed upon me. I have learned to live with the thorn, and although it hurts, it has brought me closer to God than any flower ever could. Think about that for a minute. 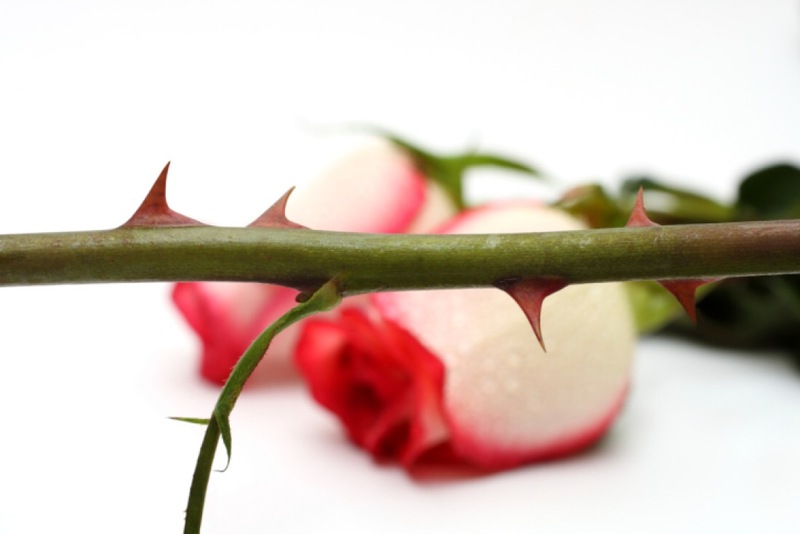 Would you trade in your flower for a thorn to get closer to God? Most will never do so willingly but He gives us all opportunities to know Him more intimately. I never asked to be so sick but I am grateful for the truths I could only know by allowing Him to walk with me on this journey. Only by succumbing to weakness could God’s strength and glory rise up in me when I had absolutely nothing left. I know I’m not really alone. I know He’s with me. He’s been with me all along. It seems like this year has been storm after another for me, and the one thing that always remains is pain. And sickness. And more pain. And more sickness. It’s enough to tire a person out. I have talked about my struggles with chronic pain this year but then I fell silent. I’ve been quiet for quite some time for a very good reason. I was diagnosed with pneumonia in June, and still getting over it. Coughing for three straight months will challenge anyone. Coughing to the point of vomiting and breathlessness is another thing entirely. I really thought I had whooping cough. I just couldn’t see how I could still have pneumonia after antibiotics and 2 rounds of prednisone. I should say that I was quite surprised to learn I was so sick in the first place. I was weaning off all of my medications, something I knew God would call me to do at some point but six months into my chronic headache seemed to soon. Still, I went with it and put all of my trust in Him to get me through the pain. As my headache got worse and I started coughing non-stop, I knew something was terribly wrong. This couldn’t possibly be from weaning off of Lyrica and everything else that never helped anyway. A month later when I was still very sick, I was told that I had bronchitis as well. Two weeks later as I struggled to take a painful deep breath, I was told I also had pleurisy. My painful ribs that had me struggling to walk were nothing more than the result of that and coughing so much. And as my breathing went from bad to worse, I had another chest x-ray done stat, only to find out the pneumonia was persistent after two months. Time for another round of antibiotics and a nebulizer for breathing treatments at home. I finally have my appointment with a pulmonologist tomorrow, and I cannot wait. I doubt he will have special powers to make me better, but I do hope to find a regimen that will finally help me breathe easier because I’m not convinced the breathing treatments have helped me. Sometimes I think they actually make things worse. I do the best I can dealing with all of this. I have a family to take care of, a job to hold down, and I have no more sick time left. All of my vacation time has been used up because of all of these things going on. Still, in the midst of everything that I have been through in the last 3 months, I have never felt closer to God. Never felt like He was there for me more than He is right now. It’s hard to explain but I’ve had to learn how to come to Him differently. I haven’t been able to sing in three months. I haven’t been able to work on music. There are days when I am so sick that all I can manage to do is cry out His name. He answers me every time. Lately, in addition to helping me through this sickness, He is also giving me strength as I learn new ways to do simple things like breathing, talking, dressing myself, getting the dogs in and out of their cages, and doing a load of laundry. Did I mention that I can’t bend over? Yeah, haven’t been able to for at least a month and a half… basically after the pleurisy stopped being so bad, everything else started hurting. Coughing for so long is really bad for your back and hips so these days I use a crutch for walking and for bracing myself when trying to stand up. It has not been a fun ride but at the same time, my faith has grown stronger. I’ve surprised myself with a resilience that could only come from God as I continue to endure more and more pain. I was ready to call 911 the other night because I couldn’t get out of my bed after several hours, but instead I wound up talking to a friend of mine about God’s goodness. I went from crisis mode to a great level of peace so fast I didn’t even see it coming. Just talking about Jesus and sharing my experiences about how He has gotten me through tough times literally got me through the most excruciating pain I have endured in a very long time. Only Jesus can bring that kind of peace in the midst of pain that wasn’t going away any time soon. Thankfully, I made it through the night and got a shot of toradol that helped some the next day. It’s amazing how thankful you are for level 8 pain after being at a 10 for so long. I’m sure I will be just as thankful when I’m able to breathe normally again too. But regardless of how long that takes to improve, I know that God’s got His hand on my life, on my struggles, and on my perseverance to withstand these challenges. He is the difference between enduring pain and having peace in the midst of pain. On another note, my family and I stayed home for Hurricane Irma, unlike Matthew when we evacuated to Alabama. Though we had damage like many families, what astounded me the most was my attitude change between the two storms. With Hurricane Matthew, I brought the storm with me in the form of anxiety, frustration, and emotional outbursts that wreaked havoc on my family. With Irma, I had a peace going into the storm that I’ve never had before. It didn’t make any sense, even while huddled in the bathroom with my family at 4 in the morning for a tornado in the area all the while knowing that a tornado warning is what sparked me to start having panic attacks years ago just from sheer fear. Instead of being swept up in the chaos of the storm this time, I remained rooted in the knowledge that it didn’t matter what happened; we were going to be okay. I have never felt such freedom and peace in my life, and I know it has to do with how much He has challenged me this year… to be fearless in the midst of the storm. He’s challenging me and my family with new circumstances now. Nothing that I can discuss right now but an opportunity for the devil to try and stretch our faith even further. I hope he’s starting to figure out that we don’t give up that easily, that God is on our side, and that He WILL continue to fight for us. How sweet it is! Lord Jesus, you are my rock and my salvation. You are the very breath that runs through my body and a beacon of hope on a cloudy day. I love you with all of my heart, and thank you for all that you continue to do for me, for all the ways you have shown up in my life, and for all that is yet to come. I pray that my story and my struggles can be used to show your love for your people, and to bring hope to the hopeless. May you be glorified every step of the way. In Jesus name, Amen.